"Is it true? Are you maleficent?" Maleficent is a surprisingly very good movie. In essence, the story told and the events that happen all serve to lead that one big moment of character development for Maleficent herself, and all the little details work all for the best of that purpose. Yet it still has lots of humour & visually impressive action, and along with some great acting & drama out of the characters, this is really one surprisingly good blockbuster. Without spoiling any of the story, all I can say is that I'm grateful they were brave (and smart) enough to twist some known facts of this classic story, for the sake of a better story in this movie. And every bit of the things that unfold in this film serves towards the main goal of developing the character of Maleficent herself. Every little details works well for this, and I'm surprisingly amazed how well they did this. It may seem a little vague through my words at first, but I might soon make a spoiler review to explain further of this. And a hard truth to admit, but I was very close to shedding tears at one point in the film...yup...it's true. So the paragraph above should state quite clear how strong the drama is, yet this film boasts tons of humour, most of which seemed naturally smooth & funny, and some even served for the purpose of this film as well. Furthermore, the action sequences employs such impressive visuals too. Some minor let downs include the time & place jumps in the earlier minutes, which could have been made smoother & clearer. And some details of the story could have been expanded for more drama & development. 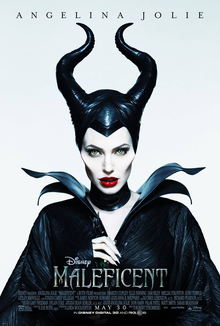 Oh, and Angelina Jolie is awesome as Maleficent!! Not to forget Sharlto Copley who was also great as the king, and Elle Fanning as Aurora is also surprisingly good. Some of the touchy moments in the film is due to the acting of Jolie herself, and some others too, which is due more than what my credit is worth. In the end, if any film could almost made me shed tears (which I have never done in the last 3-4 years for a big budget blockbuster), and yet still employs amazing visuals, brilliant acting, and boasts tons of humour & great drama, then you can bet it is worth the watch, and I highly, highly recommend you to watch it.